The SAMA5D4 CPU is ideal for any high-performance, secure, and cost-sensitive industrial application. High-speed computing needs are supported by ARM Neon and a 128kB L2 cache that increases the overall system performance. The SAMA5D4 is an ideal fit for low-cost user interface applications that require video playback. The high-grade security features allow you to protect any system against counterfeiting and software theft, while also enabling you to securely store and transfer data. 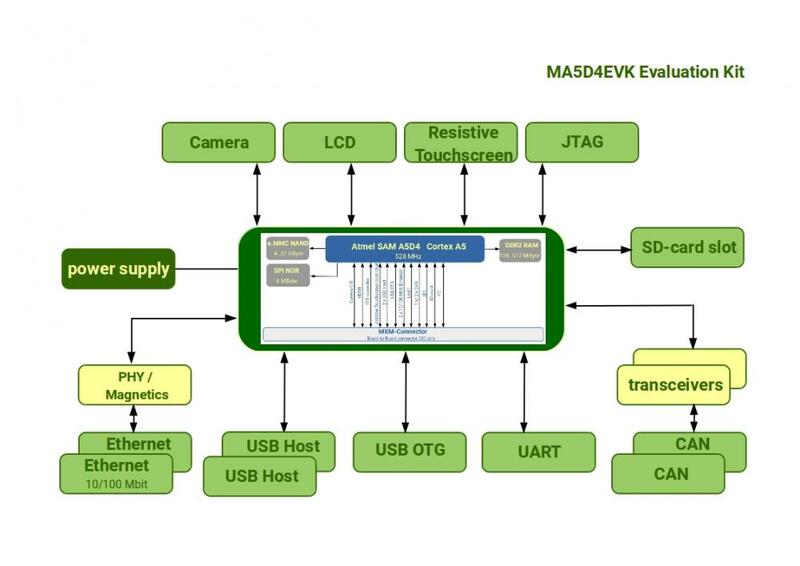 Due to the Plug'n Play concept and the completeness of the EVK it can be used either for evaluating the MA5D4 SOM or setting up a prototype. The MA5D4EVK is shipped as a complete kit including a 17,78cm (7'') TFT display with touch screen support and a USB wall plug.